Pours a light yellow color producing a very large white fizzy head with excellent retention, supported by an active body with a slight haze. Settled color is slightly darker, more in the moderate yellow range. Initially, a dominant amount of perfume hops escapes from the glass. The nose detects a medium to harsh presence with hints of perfume and citrus hops - oranges. The malt presence was light to medium, with a doughy-bread notes. Initial taste is hop forward with a moderate amount of hops with a modicum of malt sweetness, but the hops quickly ramp up to obscene at the finish with a blast of bitter grassy hops that dominate. 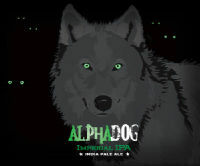 Actively carbonated and light to medium in body, the Alpha Dog is creamy in texture and very smooth to drink. Our palates were then left in a harsh drying feeling, caused by the hops. A moderate level of alcohol was present. It was not warming on the palate, but warming on the way down. Our palates were left in a damage state, after drinking the Alpha Dog, caused by a hop thrashing. Some balance exists up front with a noticeable amount of malt, but they get swept aside by the hop bomb at the finish. Alpha is used predominantly to describe animal behavior in pack animals such as dogs, wolves, etc. This wolf stands out in the pack.